95, rue Beaubourg, in the 3rd Arrondissement. 01 44 59 31 22. Mon–Sat, lunch and dinner. It’s raining in Paris… again. I know, I know, I still get to live in the City of Light, but I caught a cold too, so I’ve been a little grumpy. 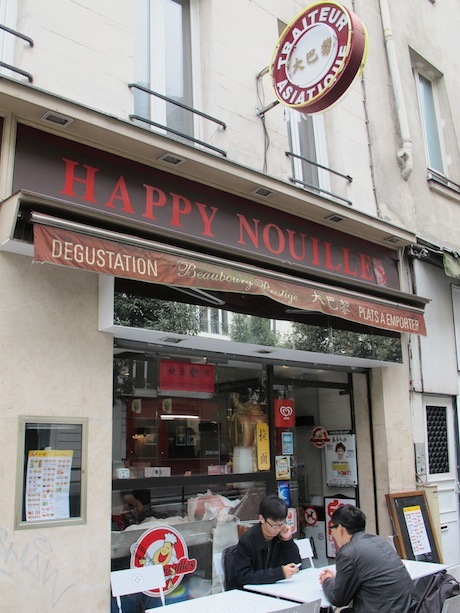 I thought about which Paris restaurant could cheer me up, and the perfect spot came to mind: Happy Nouilles. You almost can’t even say the name of the place without smiling. They named their restaurant “happy noodles,” because that is, in fact, what they do best. You don’t come to Happy Nouilles for the ambience, unless of course you want to stand in the front window and watch all the homemade noodles being made to order. The dough is rolled, hand thrown, pulled, cut, and then ready for soup immersion. You’ll also find different dumplings, generously stuffed with chicken, beef or shrimp, but what you’ve come for is the soup. The soup you want for curing a cold or the rainy-day blues is the spicy ground pork in miso broth with those just-made-from-scratch noodles. They are not stingy with the noodles, either; you’ll get a huge helping of the fresh, chewy pasta densely piled in warm, salty broth. When I say things are spicy in Paris, I feel like I need to qualify it, since Parisians don’t cook with much spice. This is the real deal: it’s eye-watering, nose-running heat. I even asked for less spice in mine, and I still went through three Kleenexes before getting halfway through my bowl, and it wasn’t just the cold talking. If spice isn’t your thing, there are other dishes to order, like crab sautéed with ginger, or chicken with mushrooms, but just make sure you get some of the house specialty—the noodles—included. Happy Nouilles does have a wine selection, but when I’m eating spicy food, the best chaser is an ice-cold beer. They serve Tsingtao and it’s a good way to balance the heat and feel refreshed after the perfect rainy-day food. 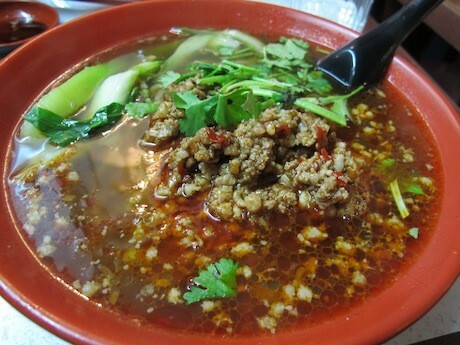 In a nutshell: For fast, cheap and authentic homemade noodles, go to Happy Nouilles for one of their spicy, soul-satisfying soups, sure to clear your sinuses. Price check: Starters, 2–8 euros; mains, 5–15 euros. If you like the sound of Happy Nouilles, you might also be interested in Les Pâtes Vivantes. Read the review. 46, rue du Faubourg-Montmartre, in the 9th. 01 45 23 10 21. 22, blvd St.-Germain, in the 5th. 01 40 46 84 33. Lunch and dinner, Mon–Sat. Editor’s note: For a gourmet walking tour, check out our DIY downloadable Paris tours.